Say it’s 9:00am and you just got an assignment. It has to be on All Things Considered by 4:00pm. You may have to throw your dreams of perfection out the window, but you can still produce a satisfying story, if you use strategies like the ones described below. 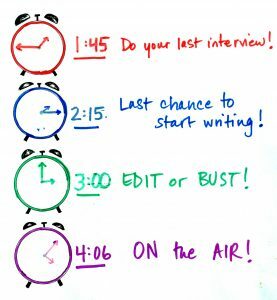 These tips are adapted from former NPR correspondent Barbara Bradley Hagerty and NPR correspondent Scott Horsley, with a little help from friends. They best apply to a beat reporter filing from his/her own office (or another dependable location), as opposed to filing from the field. Whenever possible, line up your interviews beforehand. That is, if you know the night before that there will be a news event you’ll have to cover. Get in touch with people the night before – get cell phone numbers, even arrange a time for them to be available. If news breaks suddenly, immediately make phone calls to several people. Once you get all the interviews you need, don’t answer the phone. Except for internal calls, of course. Don’t log all your tape. Use a stopwatch or a smart phone timer while you record interviews in the studio and press “start” when guests say their name and title. Then as you take notes, jot down the time codes. When you hear a sound bite you like, circle the time code and add asterisks. Say you like five actualities – you can go right to them (e.g., at 3:32 he said x,y,z) and pull them quickly. Know what you’re looking for. Log as you go (but leave room for serendipity). Star or underline or circle the best tape as you hear it in your interviews – and trust your instincts. Pre-write as much as possible. Do everything you can to make your sources informed, because that will give you the best tape. This is an example from Barb: For example, when I did a story about the Senate report on whether the government was at fault for the death of dozens of people at the Branch Davidian compound, I let a compound survivor listen to the press conference (I called him and put the phone down next to the radio speaker so he could hear). Or you can tell them what others are saying – but basically, you want smart responses. If you can tell the story in a chronological fashion, it will write itself. In general, formulas can be a useful crutch in a deadline situation. …writing is more important. If you can’t be sparking, be clear. If you can’t be clear, be short. Send your tape as early as possible… even if the tape might change a bit in the edit. That way, at least half the piece will already be in-house and a producer can be prepping the audio for air. And always make sure the show you’re filing for knows your timing. When will you be sending tape? When can they expect a final script? If you are sloppy about how you want producers to use your tape, the piece will risk not making air, and you or your editor will be fielding frantic calls at the last minute! In your final script, transcribe the actualities as they should sound and offer clear but simple mixing instructions. The transcriptions are also critical for digital producers who may need to quickly put a version of your story online. They need those quotes! Return those calls. Read those emails. Put those sources into your contact file. Do whatever will give you a head start on tomorrow’s story, or next week’s. And you get better with practice, so give your editors every reason to let you practice!